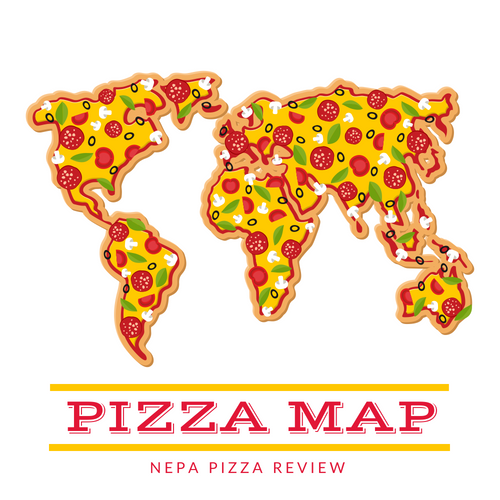 After spending a long weekend in New York City and then another in Washington DC, I can safely conclude that I feel that NYC is the far superior city in just about every way, so you can imagine I wanted to put a pizzeria who claimed to offer great NY style pizza in DC to the test. Even though I didn't have a ton of success after trying 9 pizzerias in New York City, I was optimistic about this place after my treacherous walk through Chinatown. 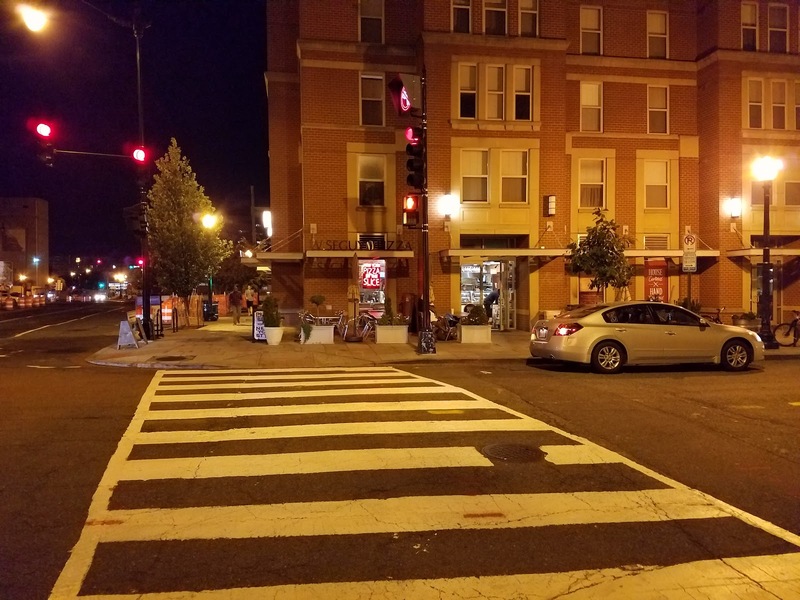 For the record, I don't recommend walking through that area very late at night as I did as it seemed to get more shady and less safe the further I walked. Anyway, I finally arrived to try the pizza after shaking a few guys asking for cigarettes and change. 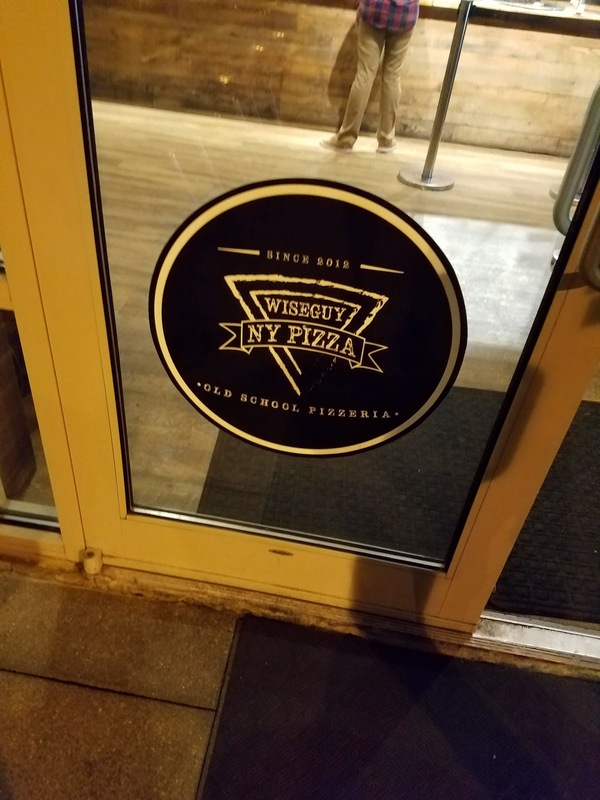 I found that the Wise Guys provided a generous slice of pizza for the money and that they had a pretty good selection of gourmet and topped pizzas ready by the slice. 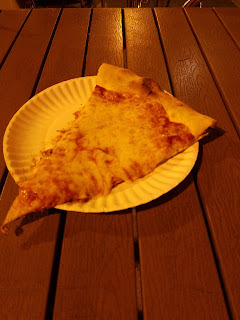 The slice that I chose already looked fresh and hot, but the pizza guy still reheated it in the oven for me without me asking - so I was thrilled because I don't know why so many pizzerias don't worry about serving a hot slice to customers. Upon trying the slice, I found it to be very tasty. 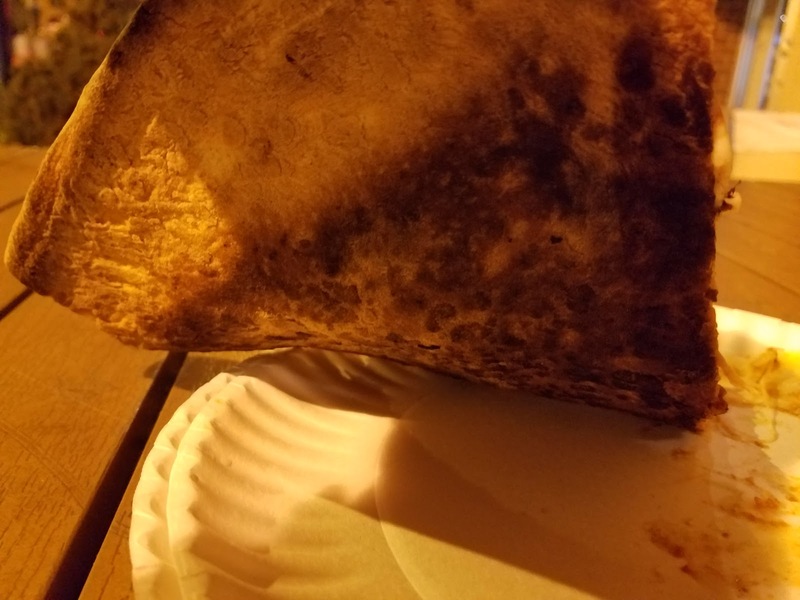 The crust was very thin and crispy, although it was inconsistently stretched and had the burned remnants from other reheated slices stuck to the bottom. This didn't impact the flavor or texture too much as it sometimes can, but it wasn't a positive for the slice. The sauce and cheese was also inconsistently applied as you can see by the random spouts of sauce poking through in some spots, but brown burned cheese in others. 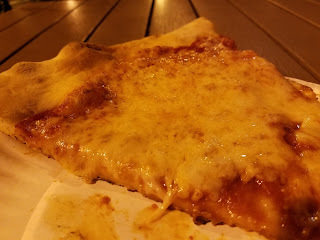 The sauce and cheese flavor combination was very good, and I enjoyed the taste more than half of the 9 pizzerias that I tried in New York City. You can read about those in the link above. 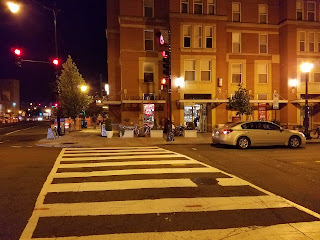 When ranked against the 4 pizzerias that I tried in DC in this area of town, I would rank this 4th out of 5. See below for my ratings and justification! Overall, I'm not sure this is a "must try" in Washington DC as it's just an above average New York Style pizza. Also, I should note that I did eat this slice outside in a poorly lit area of town so the photos actually don't do the pizza justice, FYI.